In celebration of His Holiness the Dalai Lama’s 80th birthday in July 2015, and his powerful advocacy for Global Peace and Happiness, Leon Stuparich and the Road to Peace team took to the road in June on a two week Peace Pilgrimage, walking from London to Glastonbury, without any money in the true spirit of Buddhist pilgrimage. Pioneering a new pilgrimage route from London to Glastonbury, designed in collaboration with the British Pilgrimage Trust, the walk followed a mix of ancient and modern trails. 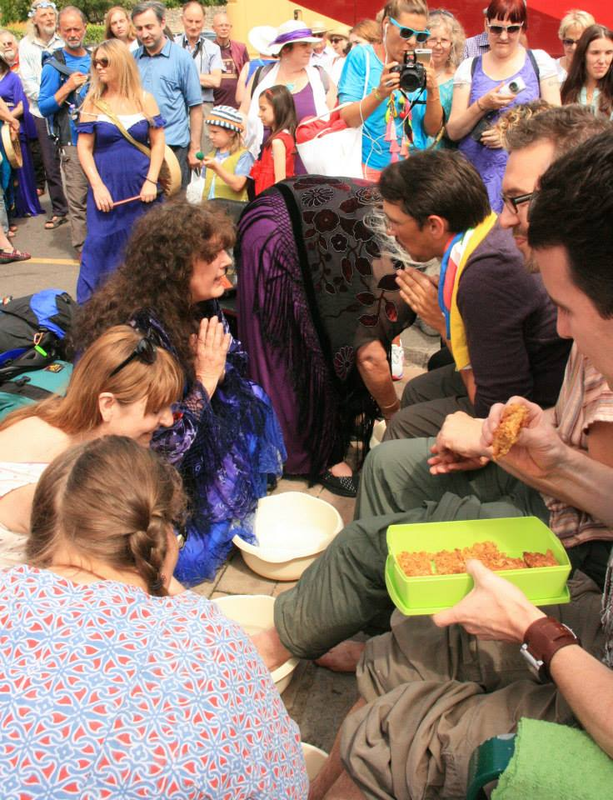 Their welcome to Glastonbury included a foot washing ceremony undertaken by volunteers of Glastonbury Pilgrim Reception Centre. Ancient Wisdom of the 14th Dalai Lama of Tibet. "I give my honour to your mother and father that has brought you to this world. I give honour to the road that has brought you this place. I offer my respect to the feet that have walked this journey. ​and may your journey on this land be all that you wish it to be."